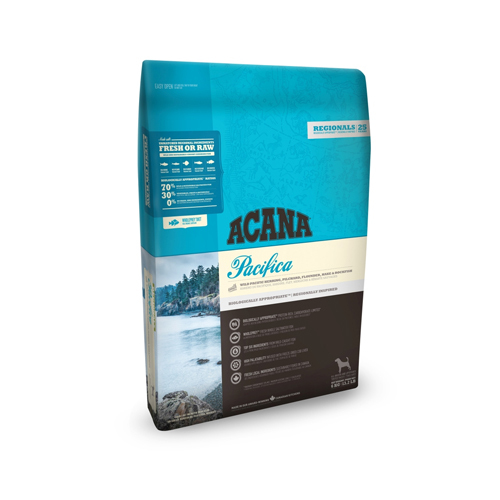 Acana Regionals Pacifica Dog is dog food with herring and flounder supplemented with fruits and vegetables. It contains fresh ingredients, is low in calories and does not contain grains or potatoes. Dogs have evolved as carnivores, with a biological need for a diet that contains a variety of fresh meat and fish combined with a small amount of vegetables, fruits and grasses. The Acana Regionals range is formulated with a variety of ingredients, such as lamb, free-range chicken, free-range eggs and fish from Canada's northern lakes. Pacifica Dog contains salmon, herring and flounder caught around the North Vancouver Island. These ingredients are delivered fresh to Acana's kitchen every day and processed on the spot. Have you used Acana Pacifica Dog Regionals before? Let us know what you think about this product.